I am Lucky Kelley, a part time mechanic at the BBP. Find me on Facebook or send me some email at lucky7kelley@msn.com. When you come to the shop, you will usually find me teaching someone how to repair or maintain their bike. When the shop is closed, I also help to build the bikes we sell and give away. I teach bicycle repair to women working for us in the Shifting Gears Program. They teach me about caring. I believe that promoting the social benefits of bicycling is the most important part of our mission. If we succeed at that, the other benefits will follow. I hope I achieve that when I help you with your bike or see you at BBP events. I got involved with the BBP by volunteering. I continue to do that by adopting bikes from the BBP and building them in my home shop. 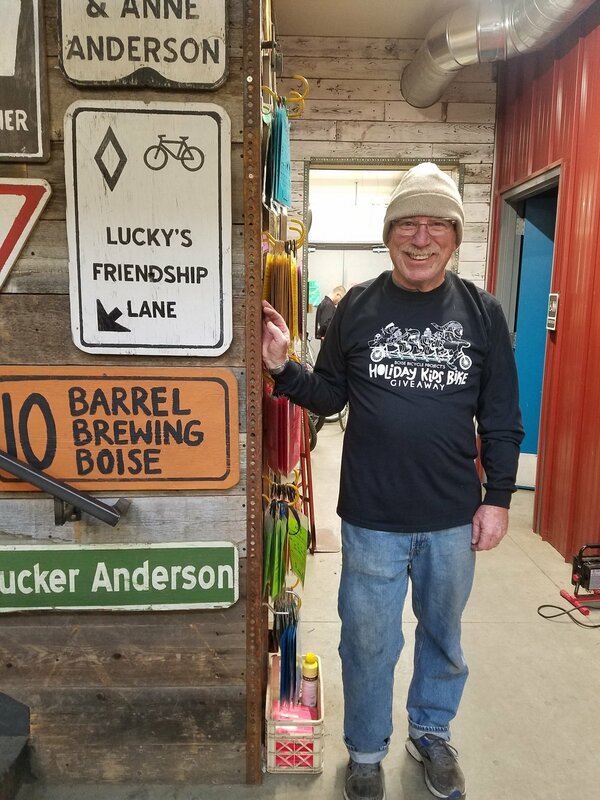 I live in Southeast Boise with my wife Joan, our two dogs Eddy and Ziggy, and some number of birds that I have little to do with. I enjoy various outdoor activities in Idaho. When the snow flies, I will be skiing at Bogus or somewhere else. If you enjoy speaking Spanish with someone who does it badly, come talk to me. I'm struggling to learn that. My garage contains the several bikes I own, some of them in various stages of being built or rebuilt. My main ride is a Bridgestone MB-3, customized for utility and riding in comfort. I seem to have gotten a reputation for enjoying Raleigh bikes. More accurately, I guess I enjoy vintage lugged steel frames, friction shifters, Brooks B-17 saddles, racks and panniers. Wrapping drop bars is a fun activity, but I eschew their use on the bikes I own. But, enough about me. Tell me what's going on with you.